[WeeklyUniverse.com] Ever get the feeling that somebody's watching you? Well, you've good reason to! Mick Farren's latest book, co-written with John Gibb, ventures deep into the world of high-tech surveillance and intelligence, from which it would seem no area of our lives are untouched by intrusion. Ranging from gambling casinos, which the authors liken to "the full surveillance police state in which, everyone and everything is constantly watched" in microcosm; through RFID cards that are used increasingly on public transport systems, in the workplace, and supermarket goods; the ever pervasive CCTV cameras that dog our every footstep, in most built-up urban areas at least; and to the internet at home or work. All these methods are used to track our every movement, our exact location, what shops we go to, what websites we visit, or what we purchase or subscribe to online -- even the seemingly benign, loyalty "store card" builds up a profile of you on the assumption of what's on your supermarket till receipt, right down to our preference in food and booze! But however innocuous the idea of loyalty cards may seem, think again -- these are only the tip of the iceberg. Scratch beneath the surface and you'll find a beast known as Echelon -- the United States's National Security Agency's monitoring system, with its HQ based at Menwith Hill, England. Aided and abetted by human attendants, Echelon can monitor every phone call, fax, email, and telex message sent anywhere in the world. Using a computer complex that includes "advanced voice recognition and optical character recognition programs, key words that match those already programmed in the high risk 'dictionary' … prompt the computer to flag any message for recording and transcribing for future analysis." Farren also says, "In a world that survives on communications, this system is a close to god-like entity that sees all, hears all, and within its set objectives, essentially knows all." Frightening stuff, really. But if that's too mind-boggling for you to comprehend, how about the more tangible, closer to home, examples of MySpace.and Google? In addition to providing the potential for identity theft, Farren and Gibb highlight MySpace's perceived shortcomings by explaining how the system provides a back door for all manner of Trojan horse viruses, spyware, and adware. Plus, in a climate where concern over online predators is high, parents may resort to snooping devices, and other MySpace tracking software, to spy on their offspring, just as anyone else can use such methods to see who's visiting their page. When this technology is extended to spy on the perceived wrongs of a spouse, lover, or offspring, the authors argue that this, "leads to establishing a generally unhealthy atmosphere of unwarranted cyber-snooping and domestic paranoia." On a more amusing note, one can't help but chuckle when the authors relate how some employers have had the foresight to check prospective employees' backgrounds via MySpace -- "young college graduates ruefully complain that they have been turned down for jobs because they had unthinkingly posted accounts of their raunchy Animal House-like antics, and even details of their sexual conquests, which were easily revealed by a MySpace search." For all its pitfalls, some of MySpace's shortcomings could easily be avoided by omitting to include any information likely to cause embarrassment at a later date, and by updating firewalls and anti-virus protection on a regular basis. As for Google, it's unlikely that any amount of preventive measures are likely to stop its inexorable quest in not just providing, but also collecting, information on just about everything -- including our personal details and every movement we make on the web. The chapter "When Google Will Know Everything" is thought- provoking enough to make one reappraise Google's motives in the wider scheme of things, and it has to be read to comprehend all of the implications of Google's ever expanding operations. 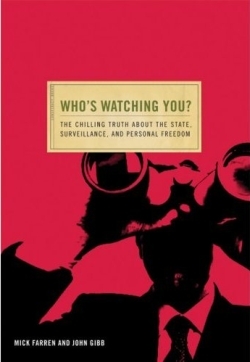 These are a few examples from twenty chapters that Farren and Gibb use to highlight the nature of modern surveillance and how it may be used against us. You might ask if this is the work of a couple of scare-mongering conspiracy theorists, providing more fuel for paranoiacs. I don't think it is. Once you've read the book, you'll see that Farren and Gibb cogently argue their case, and answer that old dicta: "If you're not doing anything wrong, what do you have to hide?" Privacy is a fundamental human right, and should be defended even if we aren't trying to hide something. Why should "they" need to know everything about you? Maybe it's because they can -- and that's what makes it all the more worrying. In 1999 Rich Deakin completed an MA thesis, "The British Underground Press, 1965-1974." He's the author of Keep It Together! 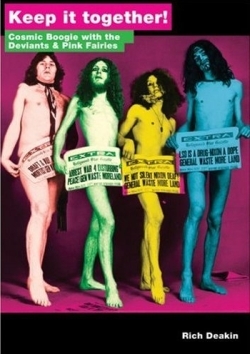 Cosmic Boogie with the Deviants and Pink Fairies, a biography of two legendary countercultural English rock bands renowned for their anti- establishment stance and libertarian tendencies in the late 1960s and early 1970s. Deakin may be contacted though his website: Funtopia.